Cold & Flu Viruses may not have cures, but there are many treatments we can do while confined to our homes during the period of illness (days to weeks). Colds and Flus usually cannot be treated with Anti-biotics, because colds and flus are usually viruses not bacterias. If symptoms worsen then a doctor should be contacted. Strep-throat, bronchitis, Scarlet-fever, and other worse illnesses should be treated by doctors. After taking skullcap for 3 weeks, I have much praise for its magic mental powers of tranquility. I bought a small bottle of ‘Oregon’s Wild Harvest’ Skullcap organic pills. Rather than swallow the pills whole and letting the thin capsule dissolve in my stomach, I open them and pour the dried powder of ‘100% skullcap tops’ onto my tongue and then swallow. It takes like tea flavored flour. 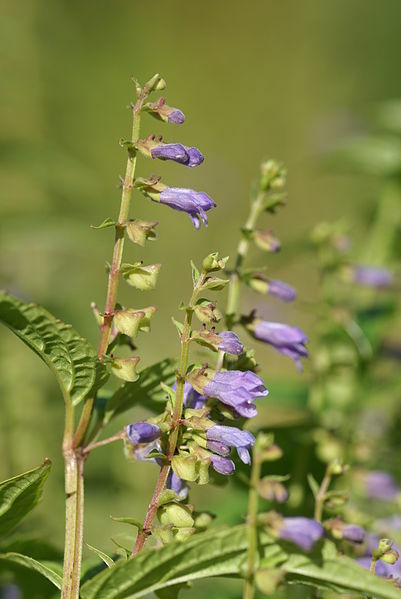 The psychoactive chemicals in skullcap cause a mild euphoric high, much like tea or coffee without the negative withdrawal effects of caffeine; and instead of the heart-racing diuretic stimulation, Skullcap has an opposite calming effect. Skullcap may be more like eating a similar small portion of cannabis, for the reasons described. I believe Skullcap is not strong enough to cause accidents, as when I was driving my traffic and weather anxiety seemed to over-ride any calming effects while driving. When I am sitting or walking, I do feel a bit buzzed, but the effect may have something to do with my desire to chill out and relax as well. The Skullcap bottle cost about $10, and after taking an average 3 pills daily and giving some away I still have half a bottle left. It seems to give me a bit of help in training my mind to be more meditative, and create a peaceful state of being. This is not a paid advertisement for this product, but I can honestly say that I desire to take the pill when I go hours without it. If it is addictive, I feel it is in the same way that Cannabis is, in that I can go without it safely, but it feels nice when I use it.